Thank you for taking the time to view the range of Northbank boats. Our team at Northbank are a dedicated group who strive to build quality products, so you the consumer can have valuable family time, enjoying the same passion we have that is boating. We don't claim to be the biggest or best at Northbank, but we do claim to build a damn good boat for Aussie conditions. Whether it is our gelcoats, resins or engraved deck cleat, we rigorously test our product. Not in our factory, but at sea by fishing with our friends or holidaying with our families. This is a true test using the boats we build, we then improve and upgrade using our own experiences and plenty of consumer feedback. That's how we do it. Take time to look at the quality of build, fit out and styling of all our boats, then get out on the water. You won't be disappointed. Good luck choosing your new boat and we hope Northbank comes up trumps. Get onboard. Northbank boats are proudly designed and built in South Australia. Our waters often have notorious short sharp chop as is the case with various waters around Australia. Designed by Naval Architects, the Northbank hull has been built around the knowledge that only time on the water can give you. All of our 650 and 600 models have been designed with offshore conditions in mind. Building a hull around a 21 degree variable deadrise generally means that stability at rest can be tender. Not so with the Northbank as we use a seven bearer system whereas other manufacturers tend to use 3 or 5. The seven bearer system adds weight and strength right where it's needed, down low. 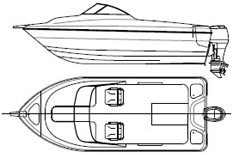 Combined with broad reverse chines, stability is excellent, a quality that is found lacking in some other boats. The 500 and 550 cuddy versions are foam filled as standard, sporting a wide walk-through to the anchor well making anchoring a breeze. Northbank hulls are well respected performers in all sea conditions, while often sporting the agility of much smaller boats. Excellent freeboard, large deck space, strong and above all safe make Northbank the first choice among recreational and commercial fishermen.